Putting together an interesting, well-written and informative article can be a painstaking, labor-intensive job. But, your job is still not completed. Unfortunately, before a written job can be considered complete, there’s the less exciting stage of proofreading and editing. If you’ve got great ideas to share, but your content is riddled with errors, you could lose the trust of your readers and your credibility. 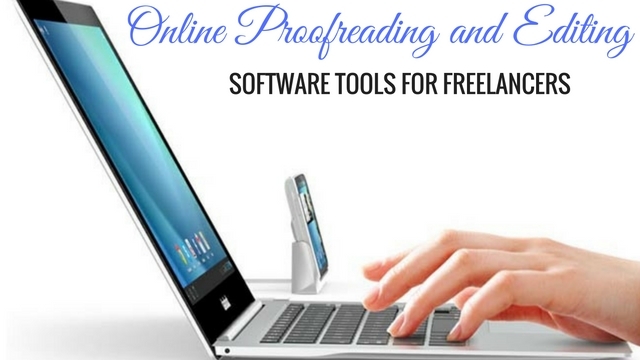 Get through this editing process quickly and painlessly, by enlisting the help of some online editing and proofreading tools, so you can get your error-free content out there. Completing a job with ease and less effort all begins with a solid foundation of preparation. Get prepared properly, before you even start the writing process. If you go into the job prepared, the rest of the steps will happen more easily. With the online resource LooseStitch, you can create an outline, brainstorm and collaborate with others. Tasks can be given to the different collaborators and you can get feedback as you go. It sets you up for success from the beginning. Once your writing is complete, enlist the help of Slick Write to point out any errors in grammar and style that you may have made. This free online resource can also give you suggestions for improvement, after analyzing your written content. For an even more detailed analysis of your written content, ProWritingAid not only gives you suggestions on what you can improve on but makes real suggestions that would make your content better. It’ll detail your overused words, cliches, and instances of plagiarism – you don’t want to get caught, intentional or not, duplicating someone else’s work, to ensure that you are only putting out original content. The advanced technology of Ginger locates errors with unmatched accuracy. It can successfully point out spelling and grammar mistakes that traditional checkers typically miss. If you’re looking for something far superior to those run of the mill checkers, this is the one you’ll want to use. If you’ve got great content, chances are you’ll have a large following throughout your social media network. You’ll want to keep that following manageable using Hootsuite’s resources for analyzing, collaborating and engaging with your readers. When you understand your followers and know what they want to see, you can improve your writing to suit their wants. Adding photos to your written content is important in injecting even more interest in your articles. Aviary is the one online resource you’ll need to edit your images and add some magic to your photos. You won’t need to invest in expensive photo editing software or spend time and effort learning how to use that software, because this user-friendly editing tool is simple for anyone to pick up and use right away. A picture says a thousand words, so use the power of images to your advantage within your content. Essay editing is just one of the many services offered by Boom editing and their team of professional writers. Because each writer is an expert in their field, their work is always highly relevant and right on topic. They’re also available for a wide range of other writing services, providing you with original content every single time. Review your content and request any changes, until you’re completely satisfied with your final product. If you need to spell check things in English and many other languages, SpellChecker is your tool to help. You can choose a variety of spell checking options, including a web spell checker or the spell check as you type product. So, if your website caters to different languages, you can be sure that the content in each language is error free. In addition to checking for grammar and spelling errors, Roo writer will analyze the title of your article and provide you with suggestions for improvements. After your entire article is analyzed, you’ll be handed a final score for your overall writing skills. The editing is done by a real, live person, who is also well versed in the topic, which is always a more accurate way of editing and proofreading than running your text through an automated checker. For fiction writers who are looking for instant manuscript editing software, AutoCrit is available to try out for free. Just by adding your text in the box, you’ll get an instant readout on any problems commonly found in writing. This can quickly eliminate a number of glaring issues, so you can then focus on finding other problems and more finely tuning your text. If you’re liking what AutoCrit’s got to offer, you can upgrade to different levels of membership. Bloggers need to stay on top of their calendar, in order to stay organized with their posts and publishing schedule. The Editorial Calendar from WordPress lets you drag and drop your schedule together, allowing you to be more productive, plan ahead and keep your blogging right on schedule. You can plan to share your content on the most optimal days and times, when your audience will be most receptive and ready to listen. Expert writing is created by professionals in the field at Type my essay. Their team of content creators meets strict requirements in order to be able to be a member of the writing crew. Services range from proofreading all the way up to complete content creation. So, whether you need a little help with fine tuning your work, or a lot of help with creating it from scratch, this team can assist you. Content creation involves several steps, one of which is the very important, but not too exciting, editing and proofreading step. Although it’s not the most fun thing to do, ensuring that your content is free of spelling, grammar and other errors helps instill a level of trust in your readers and elevates your credibility. Using these online tools can get you past this step quickly, so you can move on to your next project with the knowledge that you’re creating error-free content.